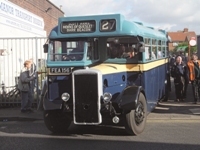 Aston Manor Transport Museum had a successful last running day on Sunday (October 16) before the closure of the venue at the end of the year. Geoff Lusher, chairman of the museum, said the day attracted 1,000 visitors, describing it as “remarkably good”. “Apart from football, there aren’t many reasons to visit Aston,” he told CBW. The museum is housed in a building, which is historicin itself – an 1880s former tram shed. Geoff explained the museum is closing “due to the City Council’s insistence for us to pay a commercial rate.” The contents will be put into storage and hopefully a new venue will be found next year, although Geoff said “it’s not certain”. “A lot of anger has been directed at the City Council on what they view as a historic part of the city,” continued Geoff, concluding that the support from people has been phenomenal.